Launched in 1977, Rubadue Wire Company is a pioneer in the wire and cable industry, having created the world’s first triple-insulated wire. Rubadue Wire has since expanded to offer numerous other solutions. SDR Ventures was engaged by Rubadue to facilitate the sale of the company and, of utmost importance, to preserve the family-run spirit that the company had established over the past 38 years. Also, while many of the stakeholders in the family were seeking an exit, some still wanted to remain involved going forward. With these factors in mind, SDR ran a full sell-side process. 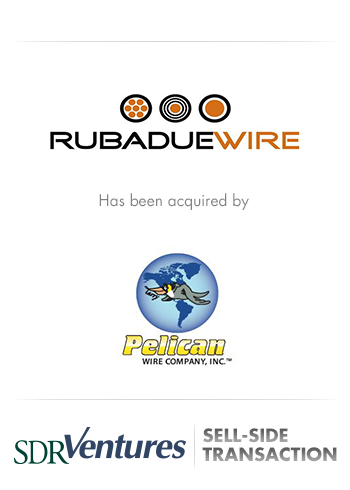 The SDR team built an extensive list of qualified buyers, created in-depth materials to educate the targeted buyers, approached the market, gathered and vetted more than a dozen offers and eventually helped lead Rubadue towards a successful close with Pelican Wire Company. But SDR’s role did not stop there. By keeping the family nature and unique shareholder goals of Rubadue top-of-mind throughout the transaction process, not only was the ownership team able to exit and achieve its financial goals for the transaction, but Rubadue’s CEO was able to continue in her present leadership role at Pelican’s new sister company. Meanwhile, the Rubadue employees were able to join a larger family at Pelican with an increased capacity for growth.